Ecosystem-based approaches to fisheries management (EAFMs) have emerged as requisite for sustainable use of fisheries resources. At the same time, however, there is a growing recognition of the degree of variation among individuals within a population, as well as the ecological consequences of this variation. Managing resources at an ecosystem level calls on practitioners to consider evolutionary processes, and ample evidence from the realm of fisheries science indicates that anthropogenic disturbance can drive changes in predominant character traits (e.g. size at maturity). Eco-evolutionary theory suggests that human-induced trait change and the modification of selective regimens might contribute to ecosystem dynamics at a similar magnitude to species extirpation, extinction and ecological dysfunction. Given the dynamic interaction between fisheries and target species via harvest and subsequent ecosystem consequences, we argue that individual diversity in genetic, physiological and behavioural traits are important considerations under EAFMs. Here, we examine the role of individual variation in a number of contexts relevant to fisheries management, including the potential ecological effects of rapid trait change. Using select examples, we highlight the extent of phenotypic diversity of individuals, as well as the ecological constraints on such diversity. We conclude that individual phenotypic diversity is a complex phenomenon that needs to be considered in EAFMs, with the ultimate realization that maintaining or increasing individual trait diversity may afford not only species, but also entire ecosystems, with enhanced resilience to environmental perturbations. 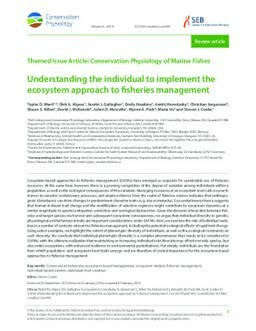 Put simply, individuals are the foundation from which population- and ecosystem-level traits emerge and are therefore of central importance for the ecosystem-based approaches to fisheries management.